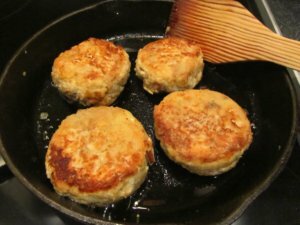 This is an Algerian fish cake recipe which will give you the best fish cakes you have ever tasted. They are a little bit different than ordinary fish cakes as they have the added flavours of warming spices, so typical of Algerian cooking. The French have a great influence in Algerian cooking and these little gems are one of the delights of the mix of French and Algerian ingredients. Although a simple recipe they are comforting and nourishing - and if you love fish, you will love these. Even people who think they don't like fish will be amazed at how good they are. They are great for any day of the week for family meals or would make an excellent option for entertaining as they are sensational. • Chop the fish and the onions very finely, you can use your food processor here for convenience. • Season with the cinnamon, cloves and black pepper. • Leave the mixture in the refrigerator for half an hour. • Finally, form the mixture into round cakes and dust with flour. • Fry them gently in the butter and oil until golden brown. • Serve with a tomato sauce or with a fresh green salad.